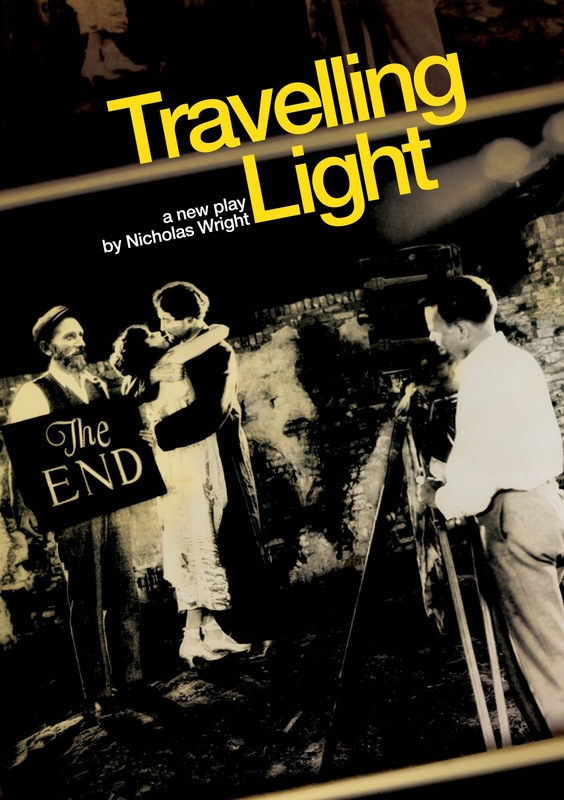 Perhaps I am more ignorant of Jewish terminology than I ought to be, but I do find it a little surprising that the blurb for Nicholas Wright’s new play for the National Theatre, Travelling Light, simply states that it takes place in “a shtetl in Eastern Europe”. I’d no idea what a shtetl was, didn’t notice any explicatory reference in the text and over the last couple of days have asked a few people, none of whom knew either. The internet informs me it is a small town with a largely Jewish population, but it does seem an odd assumption of knowledge to make (or perhaps it is just indicative of how few Jewish friends I actually have…) In any case, that this is the detail that sticks most in my mind after seeing the show is indicative of how little I cared for it. Set in the early 1900s, the play – still in previews – centres on Motl Mendl, a young Jewish photographer whose dreams and ambitions as he discovers the burgeoning art form of motion pictures set him on a path that will see him end up in Hollywood. But before he makes it big, he needs to extricate himself from domestic village life and that is easier said than done as they are a group of real ‘characters’ one and all. Chief among these is Jacob Bindel, an illiterate timber merchant who is so enthused about the potential of film-making that he stumps up the money needed to keep Motl from emigrating (for the time being at least) and to make a movie in their very own village. Or shtetl. Wright touches on a raft of big subjects: the birth of cinema, a long-lost way of (Jewish?) living, the constrictive nature of that for those with burning ambition, and ultimately the price paid by those who emigrate. This is particularly explored by the fact that the play is narrated by the older version of Motl in 1936, now a successful Hollywood director, but also forms a major problem as the events that are recollected are done so through a prism of warm sepia tones and comfortable remembrances. This lends the show the quaint, undemanding air of Sunday evening programming like Ballykissangel and Monarch of the Glen – not that that is a bad thing in itself, I used to love Monarch…, but thrilling theatre it does not make. None of the issues raised are dealt with in any exploratory depth; instead we get to follow the twee story of the village discovering the joy of cinema for the first time (but patronisingly done as if they’d never experienced the power of storytelling in any other format). And because our narrator is just a little bit biased, there’s no investigation of the impact of emigration on the loved ones left behind, the selfishness of pursuing artistic imperatives over anything else; rather there’s a Get Out of Jail Free card as the second half twists a little to focus more on the 1936 timeline. Perhaps I’m being a little harsh on the play, indeed there was little that I found to be particularly ‘wrong’ about the play per se, it just never won me over into caring about this world and I just failed to see the point of it as a piece of theatre. Given how entertained I was by Wright’s last play The Last of the Duchess, I was doubly disappointed. Performance-wise I won’t say too much as it is still early days, but Damien Molony (soon to be the new Aidan on Being Human) is highly adorable as the younger Motl, driven mad by the people around him but appealingly passionate about his craft. I couldn’t quite decide how handsome/cute/lovely he was, he has one of those faces that I could stare at for days trying to decide whether I fancy him or not (which I suppose gives you your answer!). There’s sparky turns from Alexis Zegerman, Sue Kelvin and Abigail McKern as different shades of the archetypal Jewish woman figure, but I felt Paul Jesson suffered a little from the inanities he’s forced to utter whilst narrating as the Americanised Motl, renamed Maurice, as he seemingly serves little other purpose than to cover the set changes – he’s much better when he’s finally allowed to just act. As for Antony Sher, I loved him in Broken Glass which is the only thing I’ve ever seen him in but I’ve heard much talk of why people are not so keen on him as an actor, and there were moments in here that suggested to me why that might be. He swallows the part whole and dominates the stage in practically every scene he’s in, his presence is so overemphatic that one has to remind oneself he’s not actually the lead character. Nicholas Hytner also allows the rest of the ensemble, for they are there onstage with him for most of his scenes, to simply fade away when he is working and consequently there’s a sense of imbalance that permeates. So not the play for me: at its best, Travelling Light is gentle and undemanding and thus it clearly has its place, especially in a lethargic January. But it also felt functional, lacking any real spark as did Bob Crowley’s rather uninspired design. That said, the rest of my party were, to varying degrees, more positive about the show – it just disappoints me that this is the kind of new writing that the National Theatre is promoting. Although I do now know what a shtetl is. Booking until 6th March and then touring to The Lowry in Salford, Grand Theatre Leeds, the Waterside in Aylesbury and Theatre Royal Newcastle. I have to say that I felt rather uneasy at times watching Antony Sher ham it up, channeling his inner Topol for all he was worth. I feared that a Jewish member of the audience might feel they had somehow wandered into a shtetl equivalent of the black and white minstrel show. 150 words on not knowing what a shtetl is? Fascinating. I would have thought it was obvious once we saw the setting what a shtetl was. Then more waffle about how attractive you found one of the leads (*so* important when regarding the quality of a play). If you were a journo writing to a word count, I would understand the verbosity. I liked the play very much. Yes, it is undemanding, but it covers an area of history not portrayed on stage, or in many other media, and is well suited to the NT, where a large cast can convey what it was like to live in and want to escape from an Eastern European village, sorry, shtetl. And as for the comment above: do you really think that Antony Sher and Nick Hytner would want to be involved with anything that risked being perceived as a Jewish "equivalent of the black and white minstrel show"
Oh dear…another review featuring the overuse of the pronoun 'I'. A very reductive take on the play, I must say. Not really interested in whether you fancy the lead to be honest, or whether you know what a shetl is or not (why didn't you look it up if it was that difficult to grasp?). Although the play is flawed, it has much to recommend it. But more importantly, a constructive review wouldn't have gone amiss. Lazy writing I'm afraid! do you really think that Antony Sher and Nick Hytner would want to be involved with anything that risked being perceived as a Jewish "equivalent of the black and white minstrel show"
Well, no, they wouldn't want to be but maybe they are? What a strange comment, nobody wants to be in a terrible play or film, but sometimes that's the way the cookie crumbles. Sher got a bit much for me at times in this, particularly at the start of the 2nd half. Just my take on it though. "do you really think that Antony Sher and Nick Hytner would want to be involved with anything that risked being perceived as a Jewish "equivalent of the black and white minstrel show"
I expect this comment was made as reference to both Nicholas Hytner and Antony Sher being Jewish, and that this is the reason that they would not allow themselves to produce a show that somehow presents Jewish stereotypes. For what it's worth, "shtetl" is a very familiar word in the US. I'm a little staggered that you didn't know it. Oh dear, three anonymous comments in a short space of time coming from the same IP address. I'm flattered that you spent so much of your time responding to my writing, even if it was to tell me in a variety of ways how you don't like it. As a blogger though, I do reserve the right to use 'I' – these reviews are my personal responses rather than authoritative statements and should be taken as such. And US Anonymous – the answer is in your statement really isn't it, it is a familiar word in the States… Ah well, you learn something new every day.